I was pleased to see a recent paper naming a new sauropod from Chile – Atacamatitan chilensis Kellner, Rubilar-Rogers, Vargas and Suarez 2011. 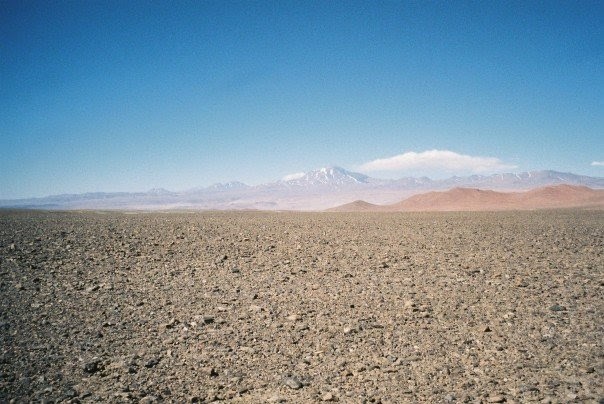 Why am I interested in Chilean dinosaurs? 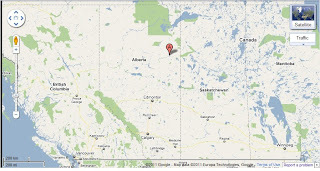 Fossils in the Tar Sands. A short but exciting post today! Shawn Funk, a shovel operator at Suncor Energy Mine near Fort McMurray, Alberta, found the remains of a possible ankylosaur earlier this week. The Royal Tyrrell Museum has been up to investigate and has posted some tantalizing photos on their Facebook page. 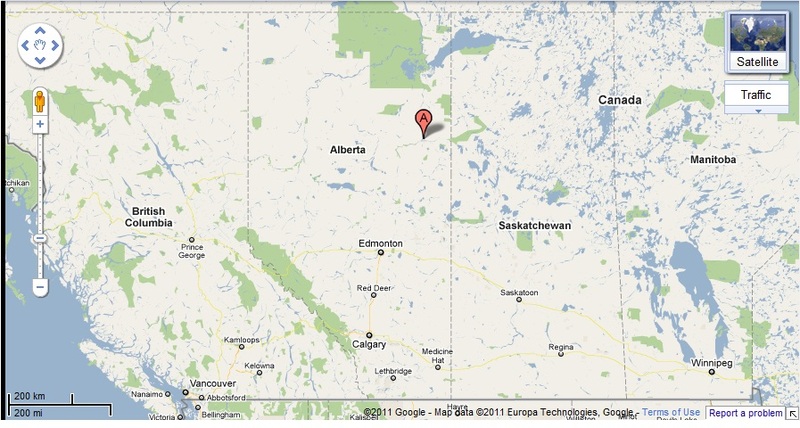 Fort McMurray, for non-Canadians, is where all of the oil comes from. This would not be the first vertebrate fossil discovered in the oil sands. The ichthyosaur Athabascasaurus bitumineus was named in 2010 by Patrick Druckenmiller and Erin Maxwell, and was found in a Syncrude Mine near Fort McMurray. The specimen was featured in the Royal Tyrrell Museum’s 25th Anniversary exhibition Alberta Unearthed – it is still oozing tar. It’s a beautiful specimen. The well-known dinosaur-bearing formations of Alberta, like the Horseshoe Canyon Formation, Wapiti Formation, and of course the Dinosaur Park Formation, are all Late Cretaceous deposits. This new dinosaur, however, is from the Early Cretaceous, and is therefore likely to be quite different from the ankylosaurs known from southern Alberta. 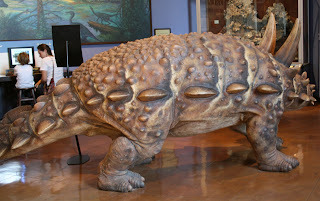 Ankylosaurs from this time period include lots of nodosaurs, like Sauropelta from Wyoming and Utah, Pawpawsaurus and Texasetes from Texas, and Cedarpelta (which may actually be a shamosaurine ankylosaurid – see Carpenter et al. 2008) from Utah. I will certainly be very interested to hear more about this new find! And great job to the folks at Suncor who spotted the fossil and called in the Tyrrell so quickly. Druckenmiller PS, Maxwell EE. 2010. A new Lower Cretaceous (lower Albian) ichthyosaur genus from the Clearwater Formation, Alberta, Canada. Canadian Journal of Earth Sciences 47: 1037–1053. Carpenter K, Bartlett J, Bird J, Barrick R. 2008. Ankylosaurs from the Price River Quarries, Cedar Mountain Formation (Lower Cretaceous), east-central Utah. Journal of Vertebrate Paleontology 28: 1089–1101. I like ankylosaur butts, and I cannot lie. Yes, I seem to have this recurring fascination for the derrière of these dinosaurs. In 2009 I published a paper (with my fellow grad students Mike Burns and Robin Sissons) on Dyoplosaurus, in which we argued that the pelvis (specifically, the sacral ribs) is different than that of Euoplocephalus. I reconstructed the muscles of the tail and pelvis in my 2009 PLoS ONE paper on tail clubbing. Twice now I have spent significant portions of my summer preparing the pelvis of two different ankylosaur specimens. And now this month I have another paper (again with Mike Burns and my supervisor Phil Currie) on the ankylosaur pelvis, this time on the armour of the pelvic region. The lovely behind of Aletopelta, from my visit to the San Diego Natural History Museum in 2009. It is an excellent museum, you should check it out! It has been recognized for a long time now that some ankylosaurs were doing really weird things with the armour over their pelvis. In some taxa, the osteoderms fuse together to form a carapace-like shield over the hips. Previously, the presence or absence of this shield has been used in phylogenetic analyses to examine whether or not a third group of ankylosaurs, the Polacanthidae, is a valid taxon (in addition to the Nodosauridae and Ankylosauridae). However, it is not just the presence or absence of the pelvic shield, but the way that the pelvic shield is constructed, that may be important. In this paper I and my coauthors propose a revised way of looking at the pelvic shield that breaks shields up into three categories: 1. fused, rosette pattern, 2. fused, uniform-sized polygons, and 3. not fused. “But Victoria, if the osteoderms aren’t fused, then why call it a pelvic shield?” you may ask. 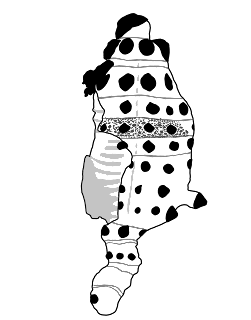 Well, after looking at the AMNH’s Sauropelta and the BMNH’s Euoplocephalus, I noticed that although the osteoderms of the pelvis weren’t coossified, there also weren’t any transverse bands segmenting the body in that region (see image below of BMNH R5161, the holotype of Scolosaurus discussed in this post). 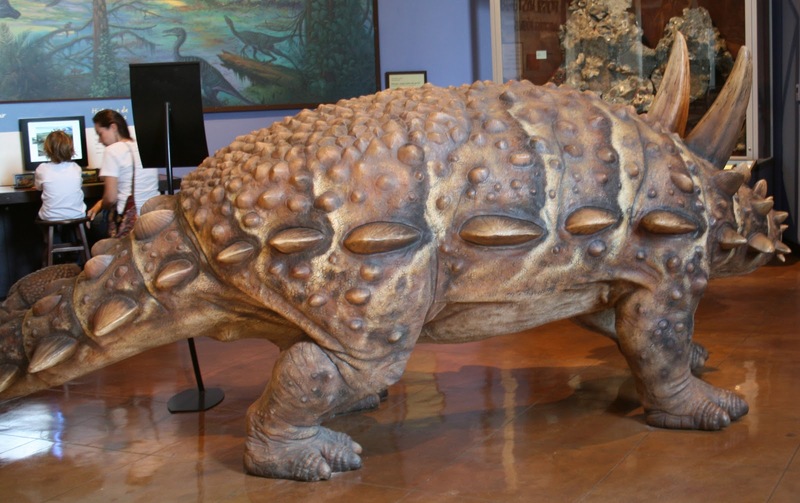 Although the osteoderms aren’t fused together, they still form a continuous shield over the pelvis. The always exciting headless, clubless, BMNH R5161, modified from Nopsca’s 1928 paper and as seen in Arbour et al. 2011. More interesting, though, is what happens when we look at the other two categories – rosettes vs. uniform polygons – in a stratigraphic and geographic context. Rosettes are restricted to the Jurassic and Lower Cretaceous, whereas uniform polygons are primarily Upper Cretaceous. Uniform polygon shields are only found in North America (with the possible exception of Antarctopelta…which is from Antarctica). We did not run a phylogenetic analysis for this paper, but I plan to incorporate this data into subsequent analyses stemming from my PhD thesis on the phylogenetic relationships and biogeography of the Ankylosauridae. I will be very interested to see if any clades show up that reflect these stratigraphic and geographic patterns. Arbour VM, Burns ME, Currie PJ. 2011. A review of pelvic shield morphology in ankylosaurs (Dinosauria: Ornithischia). Journal of Paleontology 85:298-302. More papers about ankylosaur pelves! Arbour VM, Burns ME, Sissons RL. 2009. A redescription of the ankylosaurid dinosaur Dyoplosaurus acutosquameus Parks, 1924 (Ornithischia: Ankylosauria) and a revision of the genus. Journal of Vertebrate Paleontology 29:1117–1135. Arbour VM. 2009. Estimating impact forces of tail club strikes by ankylosaurid dinosaurs. PLoS ONE 4: e6738.